This book presents comprehensive and in-depth coverage of traffic engineering. KEY TOPICS It discusses all modern topics in traffic engineering, including design, construction, operation, maintenance, and system. For anyone involved in traffic studies, engineering, analysis, and control and operations. Typical traffic engineering projects involve designing traffic control device installations and modifications, including traffic signals, signs, and pavement markings. Examples of Engineering Plans include pole engineering analysis and Storm Water Prevention Programs (SWPP). However, traffic engineers also consider traffic safety by investigating locations with high crash rates and developing countermeasures to reduce crashes. Traffic flow management can be short-term (preparing construction traffic control plans, including detour plans for pedestrian and vehicular traffic) or long-term (estimating the impacts of proposed commercial/residential developments on traffic patterns). Increasingly, traffic problems are being addressed by developing systems for intelligent transportation systems, often in conjunction with other engineering disciplines, such as computer engineering and electrical engineering. 1. Introduction to Traffic Engineering and Its Scope. I. COMPONENTS OF THE TRAFFIC SYSTEM AND THEIR CHARACTERISTICS. 2. Road User and Vehicle Characteristics. 3. Roadways and Their Geometric Characteristics. 4. An Introduction to Traffic Control Devices. II. TRAFFIC STUDIES AND PROGRAMS. 7. 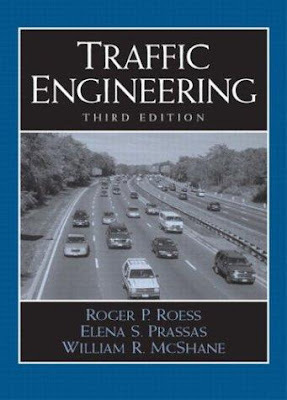 Statistical Applications in Traffic Engineering. 8. Volume Studies and Characteristics. 9. Speed, Travel Time, and Delay Studies. 10. Highway Safety and Accident Studies. 11. Parking Studies and Programs. III. APPLICATIONS TO FREEWAY AND RURAL HIGHWAY SYSTEMS. 12. Capacity Level and Level of Service Analysis for Freeways and Multilane Rural Highways. 13. Turbulence Areas on Freeways and Other Facilities: Weaving, Merging, and Diverging. 14. Two-Lane, Two-Way Rural Highways. 15. Traffic Control for Freeways and Rural Highways. 16. Introduction to Intersection Control. 17. Basic Principles of Intersection Signalization. 18. Fundamentals of Signal Design and Timing. 19. Elements of Intersection Design. 20. Actuated Signal Control and Detection. 21. Analysis of Signalized Intersections. 22. Applications of Signalized Intersection Analysis. 23. Analysis of Unsignalized Intersections. 24. Signal Coordination for Arterials and Networks. 25. Analysis of Arterial Performance. 26. Arterial Planning and Design. 27. Traffic Operations and Planning for Urban Street Networks.